How Do We Support Libraries? Find out how EveryLibrary provides pro-bono support for library campaigns and elections and how we build political support for library funding. Sadly, there are many people who don't realize that libraries are one of the best investments a community can make. Organizations like the Koch Brothers funded SuperPAC, Americans for Prosperity, don't seem to understand that libraries often return between $5 and $10 to the community for every dollar spent on them and provide services to the hundreds of millions of Americans that visit them every single year. There are many politicians like Donald Trump and Kentucky Governor Matt Bevin who are cutting libraries from the budget because they don't realize that libraries provide important programs and services like storytimes, after school help, resources and services for small business and startups, and services for returning veterans. Across the country, we have even seen school libraries and library funding decimated by school boards. You can take action to support libraries through petitions, pledges, and more here! 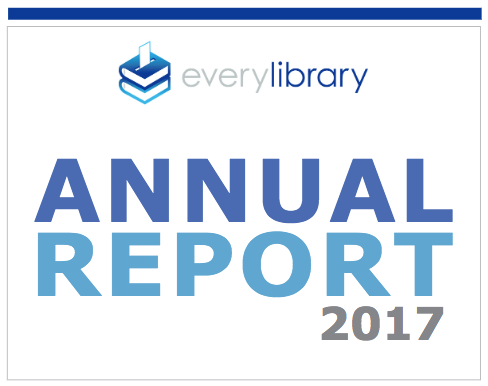 When we started EveryLibrary, our mission was clear and unique in the library advocacy space: build voter support for libraries. Since 2013, we have worked with over 100 libraries to fight the good fight for funding on their Election Days and we have supported dozens of other libraries through our petitions and political action. We are continuously fighting for both public libraries and school libraries. We have trained thousands of librarians and library supporters to take action for their libraries and we support over 20 libraries at the ballot box each year. We are fighting for many other libraries that are fighting against bad legislation and politicians who want to defund them. But planning to win is exactly what we like doing every day as a 501(c)4 and the first national Political Action Committee for libraries. We are unique as a 501c4 organization because we can focus on legislative work and building voter support for libraries. This is a critical distinction because over 95% of library funding is dependent on the will of voters and legislators. Having a 501c4 non-profit designation (instead of the more common 501c3 designation) allows us to use a wide range of tools that are not available to many of the other library advocacy organizations in the United States. And, while these 501c3, advocacy, and membership organizations do amazing work that we fully support, we can use all of the political tools at our disposal to talk directly to the voters and legislators about voting yes for library funding. Most importantly, we are dedicated working in conjunction with other library advocacy organizations and to providing all of our tools, data, and services to libraries, library support groups, library associations, and library advocacy organizations free of charge thanks to our generous donors. With support from people like you we have won many political actions for libraries. In fact, we have been so successful that for every dollar that we have raised we have been able to return over $1,600 to libraries in stable funding totaling over 250 million dollars. That means that a $5 a month donation can help libraries earn almost $100,000 in stable funding. We are able to do this work because we are funded through donations from many of our library vendors and thousands of individual library supporters across the country. We are dedicated to transparency in funding sources for our work and our 990s are publicly available on Guidestar where we are a Gold Rated Non-Profit. You donations go to fund a wide range of activities that support libraries. For example, we have built the largest and most powerful political action website that is specifically designed to fight for libraries here at action.everylibrary.org. We have also created an equally powerful platform just for fighting for school libraries at saveschoollibrarians.org. We conduct research and build and understand the data around voter support for libraries. We have one of the largest and most active Facebook pages to support libraries where we reach almost 2 million Americans every single week through digital ads across a wide network. We create written content, videos and images for libraries and campaigns to use to educate voters about the importance of libraries. We provide pro-bono strategic consulting support to library elections and campaigns across the country and we rally hundreds of thousands of Americans to fight back when their local libraries are threatened. And of course, thanks to support from people like you, we conduct all of this work at no-cost for libraries. Please consider making a contribution today through this page. Feel free to give as much or as little as you can, but our fundraising goal for any election cycle is a lofty $250,000 by November. As a 501(c)4 organization and Political Action Committee for libraries, you are allowed to give as much as you like. If you have any questions, please don’t hesitate to contact us through the comment box listed below. Thank you for your time, you can make a difference today. "When I heard about our library bond measure I immediately thought of EveryLibrary. You helped us tell our story the right way. The knowledge, confidence and structure EveryLibrary provided was a big part of our campaign’s success." We do this work because we know how libraries matter to all ages and abilities. We want to live in an America with libraries at the center of community life with educational and entertaining programs and services for people of all ages and walks of life. We also understand that librarians matter to the people they serve. We want an America where everyone can turn to their librarian for resources they need, answers they want, and a more literate and democratic society. Please join us today. I am not only a library supporter, I am a library user! My chosen work was being a librarian at libraries! I worked in libraries for 40 years and 12 days! My reading preferences are crime drama fiction, police drama fiction, and novels with families and children as characters. Reading is an excellent habit. I encourage readers to continue reading!